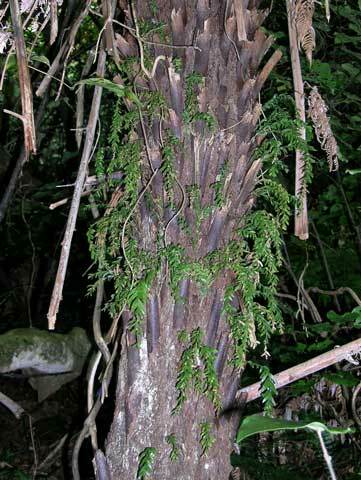 We have just described a new species of Tmesipteris fork fern. Fork ferns are odd looking and only distantly related to other ferns. Banks Peninsula fork fern, Tmesipteris horomaka. Photo by Leon Perrie. © Te Papa. We now recognise five species in New Zealand. There are only about 15 species around the world, with Australasia their strong-hold. 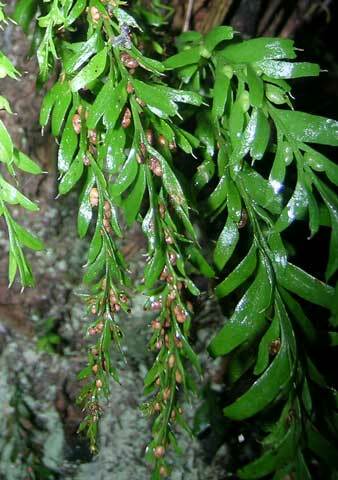 The new species has been named Tmesipteris horomaka. It is only known from Banks Peninsula. Horomaka is a Maori name for Banks Peninsula. The new fork fern is very rare. However, some of the other species in New Zealand are common, and frequently encountered hanging from the trunks of tree ferns. Look out for them – they are quite distinctive! Banks Peninsula fork ferns epiphytic on ponga (Cyathea dealbata). Photo by Leon Perrie. © Te Papa. The first indication of the new species came with the finding that some Banks Peninsula plants had double the chromosomes of other New Zealand fork ferns. However, the new fork fern also differs in its leaf and reproductive characteristics. Paper describing and distinguishing the new fork fern species. Type specimen of Tmesipteris horomaka on Collections Online.